(CNN) – Sen. Rand Paul, who practiced as an ophthalmologist for 17 years before entering Congress, is back at home performing free eye surgery for patients Tuesday. The Kentucky Republican said it's "an amazing thing to see someone sit up and be able to see better," but he's also keeping up his skills so he can eventually return to the medical field. "I think that we need to have people who are willing to reclaim their place in regular life after politics and not just say, 'You go into politics and that's what you're going to do forever,'" he said in an interview with CNN. "So I envision myself coming back to Kentucky and practicing medicine at some point." Senate ethics rules prohibit Paul from maintaining a for-profit practice while he's in Congress, so he does pro bono eye operations multiple times a year. On Tuesday, he's working on four patients in Paducah, Kentucky. Each of them are in their 50s or 60s, need cataract surgery and don't have health insurance. The procedure, he said, can normally range from $5,000 to $8,000. He plans to travel to Guatemala in August to perform operations with a team of surgeons from the University of Utah. "We're excited about that. I operated on a bunch of kids, oh, 15 years ago in Guatemala–some of them are grown now." 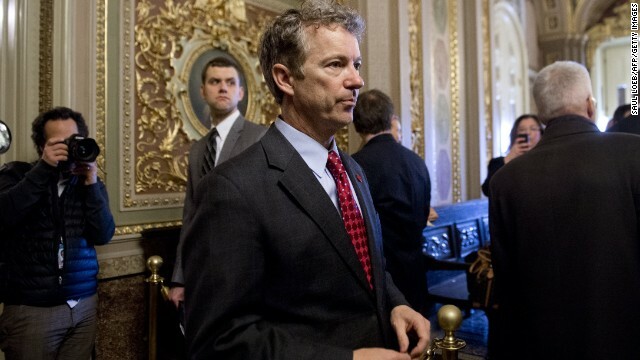 Paul, who's seriously considering a run for president, said the procedures are a nice break from his current day job on Capitol Hill. "We don't argue...We figure out what the problem is and we try to fix it, which is a lot more effective way," he said. "I wish politics was a little more like medicine." Rant should study psychiatry so he can figure out why he insists on promoting policies that have NEVER in the history of humankind resulted in sustainable, broad-based prosperity and a civil society. Sure Rand you can return to medicine just as soon as you get board certified. No Rand you cant create your own certification. He should go now back to medicine. It sounds as if he misses it and would be better at it then a senator in the US Senate. I don't think that Paul has a real grasp of the current world. He is an idealist that doesn't realize that the world doesn't fit his ideals. -–good for you, don't defraud on Medicare. Also take Ted Cruz, Jeb Bush as partners for office managers in a remote area to practice with PAs, and NPs. Lucks. Rant should go practice medicine in a third-world country, so he can see and learn firsthand how average folks live when the top 1% own and control everything, education and healthcare are privileges reserved for the wealthy elite, and infrastructure is neglected because the nation's resources are funneled to the "job creators" at the top. Smith, your claims of finding all violence distasteful notwithstanding, you are the one who has repeatedly said that the country in general and liberals in particular should avoid talking about gun violence because its a losing issue. How do you ever expect people to solve difficult problems if they refuse to deal with them? Btw, deaths by other means rarely enter the discussion because its a little unusual for people to commit mass murder with something other than a gun. While your math is correct and should be applauded, your willingness to dismiss the necessity of reining in the gun culture in this country, a culture that glorifies and deifies weapons as symbols of freedom when they are nothing more than functioning killing machines, shows that you really are not willing to face the problem. Guns enable a deranged person to kill far more easily and efficiently than by any other means, and the notion that the 2nd Amendment is somehow exempt from regulation is a cruel farce. If you don't believe me, read Antonin Scalia's opinion in the DC gun case. "There is absolutely zero justification for 10 percent of the country's population to need free lunch. This is simply more, and more subsidizing of kids, for deadbeat parents." Screw the children! It's their own darn fault they were to people who are all obviously deadbeats, the fact that food assistance goes to the working poor notwithstanding! Screw them – and praise Jesus while you're at it, because we're a Christian nation! No time like the present, Randroid. Your future could be now. Make it so. "why do you hoot and hollar over gun related murders but stay silent about all the murders committed without firearms?" 4.1% were with shotguns; 3.8% were with rifles; 18.5% were with unspecified firearms. 13.3% of homicides were done with knives or other cutting instruments. 5.8% of homicides were from the use of hands, fists, feet, etc. Now, given those statistics, you tell me which method of murder/violence we should be most concerned about and defend your answer using facts. Ready? Go! @Tom P-Tell me what are you going to do? What can we do? A gun ban is not possible and it wouldn`t stop the killings anyway. Do we create a police state and give the law more power? @ThinkAgain – Don't like Congress? Get rid of the repub/tea bag majority. Conservatives are angry because these program's of hers are making a measurable improvement in childhood obesity. "@Tom P-Tell me what are you going to do? What can we do? A gun ban is not possible and it wouldn`t stop the killings anyway. Do we create a police state and give the law more power?" Isn't that what you guys want in terms of "rooting out" all the illegals and "sending them back where they came from"? Why not "root out" all unregistered and legally owned firearms while we're at it, eh? Fair trade? I mean, as long as we're creating a police state for the conservatives to pander to their hopes that they can stop the "browning" of Amurika (and their demographic Armageddon that comes with it), then why not use it to also try to do something about all the unregistered, illegally owned MILLIONS of firearms just floating about polluting our society? "Why not "root out" all unregistered and legally owned firearms while we're at it, eh?" "There is absolutely zero justification for 10 percent of the country's population to need free lunch. This is simply more, and more subsidizing of kids, for deadbeat parents."" The turd already fell out of the doggy, Ricky. The House GOP/Teatrolls already passed a bill that defunded summer school lunches for inner city kids but kept funding it for rural kids. Nothing could possibly better highlight that it's not about "the mooching" for the GOP/Teatrolls, but rather WHO is doing it. Ask them on the street about rural kids and families...then find another and ask them about inner city kids and families...and keep it going. I guarantee you that you will find that the GOPers/Teatrolls have no difficulty whatsoever fabricating an endless list of excuses for "rural" kids and families, while they can't even think of a single one for "inner city" kids and families. Guaranteed. And we ALL know exactly what that's about. Paul is pretty scary as a senatror. Even more as a possible president. He's even more scary with a scalpel in his hands.